If you have any general questions about the videos please read the frequently asked questions below. Or, for additional information please contact a Dear Doctor representative at (866) 821-5458. If you have a specific question for the American Academy of Cosmetic Dentistry (AACD) or would like to become an AACD member, please call (800) 543-9220. Are you with a website company? Call Dear Doctor at (866) 821-5458 to learn more about adding the videos to your clients' websites. After becoming an AACD member, how long before I am able to access these videos? Our system is updated daily, so please check back tomorrow. If you continue to experience trouble logging into the site, please call a Dear Doctor representative at (866) 821-5458. If you can't remember your password, go to the login screen and enter your email address that corresponds to your AACD membership and we will send you an email with your login information. Can I add these videos to my site or is a website programmer needed? If you have administrative access and your site is set up so you can make changes to it, all you need to do is copy and paste the supplied embed code into the page where you want the video to appear. If you do not have the ability to make a change, your website company will need to assist you in adding the videos to your site. I have a content management system (CMS). How do I add these videos to my website? Visit the “Browse Videos” page and select the video you would like to add to your website. Scroll down to the Installation Options. Choose the embed type, size of the video, and whether or not you would like the video to autoplay when a visitor arrives on your webpage. Agree to the terms and conditions and click the “Get Embed Code” button. You will then be provided with the code. Copy and paste the embed code into your webpage where you would like the video to appear. Where am I allowed to embed these videos? These videos were created to help grow your practice and help your patients understand and make informed treatment decisions. With that in mind, we wanted to give you freedom to use the videos where they can serve you best. Not only can you add these videos to your practice website(s), you can also use these videos on your practice blog as well as use them for social networking on your practice Facebook page(s). Are these videos available for my waiting room TV? Yes! 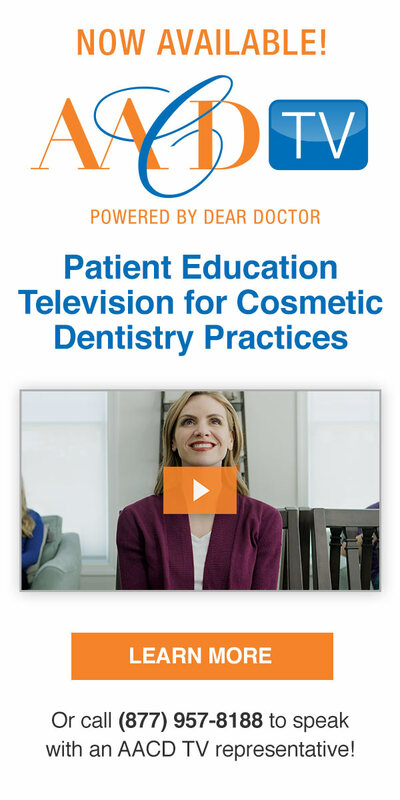 These AACD endorsed videos are part of Dear Doctor TV. Please visit DearDoctor.tv to learn more. Can these videos be viewed on phones or mobile devices? Yes. These videos will play on all Internet connected mobile devices. Do I have to use every video or can I select just one? You can use as many of the videos as you like. Just preview the video on the “Browse Videos” page and select the videos you want to use. Can I add multiple videos to the same website page? Yes. Many doctors choose to have a “Dental Videos” page where multiple videos appear. I already have videos on my site. Can I add these videos as well? Yes, these videos can be added to a website that already has video on it. Will these videos work with my Dear Doctor Digital Library? Yes, these videos are the perfect companion to your Dear Doctor Digital Library. Now when visitors view your site's treatment pages, they can first be presented with these videos but then also have access to our in-depth related article about that particular treatment. How can these videos benefit my patients? Patients will be more informed and gain a better understanding of cosmetic treatment options and benefits. This will enable the patients to make educated decisions for optimal oral health. How would my practice benefit from using these videos? Videos help the patient visualize and understand the best treatment options available which increases case acceptance. Dentists who use the videos will spend more time performing their dentistry and less time explaining it. Why are the videos stuttering when I play them? We know stuttering is annoying, and there are many possible reasons why you may be experiencing poor video playback. Dear Doctor Videos require a better than average Internet connection and computer processor, so if you have a slow connection or older computer, you may experience issues. Please turn off any other programs, virus protection, ad block, or energy saving settings as they may interfere with video playback. Try another browser and see if that helps.